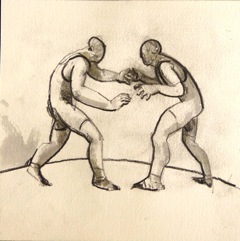 Wrestling is a proud and ancient sport. From the Sumerians 5,000 years ago, to the present day Olympics, wrestling remains a leading combat sport of honour and respect. During the 20th century, wrestling diversified with the addition of professional/entertainment wrestling to the many local amateur codes. But key to the success of any sport is good governance. Wrestling, both nationally and internationally, has suffered the impact of poor governance. With 2013’s Olympic expulsion and re-inclusion a corner has been at once revealed and turned. Wrestling in the UK is currently reshaping itself for a solid 21st century and the next 5,000 years. In this presentation Colin Nicholson, chief executive of British Wrestling, the governing body of the sport of wrestling in the UK, presents a review of the challenges facing British wrestling going forward. He will explain the impact of the Olympics on modern wrestling, with its values, funding and prized pinnacle of sporting achievement; and how wrestling’s additional status as a Commonwealth sport helped garner state support. He will discuss the impact of the controversial proposal to remove wrestling from the Olympic Games. Finally, he will outline British Wrestling’s plans to “reboot” the sport for the 21st century. Following the presentation there will be a roundtable discussion with Colin, joined by the Chair of British Wrestling, Cary Depel; and non-executive director responsible for commerce and revenue generation, Steve Cooke.